Menlo Park, California-based Blue Willow Systems, developers of a software as a service (SaaS) platform designed to detect falls and provide analytics to senior living facilities, has named Bob Bailey as its new CEO. Bailey has served as the company’s chairman of its board of directors. Prior to joining the company, he led the team of PMC-Sierra, a communications company that provided broadband and enterprise storage technologies. He has also worked with national companies, including Micron, AT&T and Texas Instruments. Minnetonka, Minnesota-based Health Dimensions Group (HDG) has expanded its consulting leadership team. The company provides consultation in post-acute and senior care and management services for hospitals, health systems, post-acute, long-term care and senior living communities. Stepping into the role of executive vice president of consulting is Erin Shvetzoff Hennessey. Hennessey has served in numerous roles for the company, and is also currently serving as CEO of HDG’s RevGroup practice, which specializes in revenue cycle management. Also joining the group is Beth Carlson, who will serve as vice president of consulting in innovation and value. Carlson brings broad knowledge and more than 30 years of experience as a post-acute clinician, operator and consultant to her role. Cindy Olson will also join the team as vice president of consulting in business development. She brings more than 25 years of experience in national sales and marketing communications strategy to the company. Prior to joining the team, she served as senior director of customer experience at The Evangelical Lutheran Good Samaritan Society, a non-profit senior and services provider. Radiant Senior Living has welcomed Sherry Lebed Davis as its new vice president of sales and marketing. In her new role, Davis will oversee all aspects of training and management of Radiant Senior Living’s business development team. Prior to joining the Portland-based community, Davis served as regional director of sales and marketing for Brookdale Senior Living. Davis has been a speaker, author and business owner over the past 20 years. Murfreesboro, Tennessee-based National Health Investors, Inc. (NYSE: NHI) has welcomed Michelle Kelly as its new senior vice president of investments, effective September 1, 2017. In her new role, Kelly will oversee business development and management of the company’s customer relationships for the western U.S. Prior to joining the company, Kelly worked for an Ohio-based real estate investment trust (REIT), as well as GE Healthcare Financial Services. Incorporated in 1991, NHI is a REIT whose portfolio consists of independent, assisted and memory care communities, entrance-fee retirement communities, SNFs, medical office building and speciality hospitals. Argentum, an association that supports companies operating professionally managed, resident-centered senior living communities, has named Angela Kennedy its new vice president of quality and accreditation. 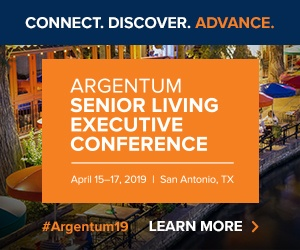 She will continue to build on the work began last February, when senior living providers began attesting to Argentum’s Phase 1 Standards, which address key imperatives designed to complement state laws and regulations. Prior to joining the organization, Kennedy was director of quality Improvement for the American Society for Radiation Oncology (ASTRO), where she managed the leadership for initiating, developing, managing and evaluating the organization‘s quality programs and initiatives, which included developing an accreditation program, quality metrics, and national standards. Angela also has been a project manager for multiple projects within the Department of Health and Human Services for Booz Allen Hamilton and an adjunct faculty member at the University of Maryland’s University College in the Health Services Management Department. She serves as vice chair of the Quality Improvement/Practice Improvement Component group for the Council of Medical Specialty Societies; is a member of the Leading Practices Committee for the National Quality Registry Network; and holds membership with the Joint Commission task force for the project Adaptation and Dissemination Outpatient Infection PrevenTion (ADOPT) Guidance. Newmark Grubb ACRES (NGA), a Salt Lake City-based full-service commercial real estate brokerage, has welcomed Summit Senior Housing Advisors (SSHA) group members McSean Thompson and Sam Bechthold to their team. The duo will lead NGA’s senior housing investment division. McSean has extensive experience in data science and analytics, having completed a five-year engagement with the Ministry of Higher Education and Scientific Research in the United Arab Emirates. Bechthold is a health care real estate professional, who brings experience in brokerage, asset management and senior housing operations, including business development and investment analysis. His career in the industry began as a senior investment analyst and asset manager at Welltower. Bonita Springs, Florida-based Solaris Healthcare, an operator of 16 skilled nursing and assisted living communities throughout Florida, has named Cyndi Byars as its director of community outreach. She brings more than 20 years of marketing and business development experience to new role for the company.